In early Feburary, I requested a cab for a 4:00 a.m. pickup from my home to get to the airport. The fare is usually between $36 – $40 (I take the route frequently). I admit that on that morning, I did not notice whether the meter was zeroed before we departed that early morning. At arrival at the airport, the meter read $52. I unsuccessfully disputed the fare with the cab driver (Chris). When I told him that I wasn’t prepared with appropriate change (I usually paid $40), and that I would need $8 in return (from $60), he told me he only had $3 to provide change. At this point, the driver held my bag (hostage) while I needed to catch a plane, so I accepted the $3 for a total fare of $57 just to be on my way. I explained to Chris that I would be complaining when I returned and I requested that he prepare a detailed receipt including cab #, driver name, and total fare. I called the cab company several days later (when I had returned), explained what happened and requested a refund. The dispatcher assured me that the manager (Frank) would call me back that day. Days passed, and I called again and explained that I wanted a refund. The dispatcher assured me that the manager (Frank) would call me that day. More and more days passed. I called my local cab licensing/enforcement agency (an arm of the local police) and explained what happened and how I had tried to resolve the problem. The first thing I was told is that the cab company did not have a driver named Chris, because he was not on their approved (background-checked, finger-printed, allowed to pick up fares) list. I assured her that indeed his name was Chris and that I had paid him $57 for my local trip to the airport. When the police called the cab company, they successfully achieved a $22 refund and an apology on my behalf. However, it came at a cost — the police opened an investigation because the cab company had allowed an unapproved driver to pick up fares! So even though the cab company had already fired Chris, all of a sudden they are now in the center of a certification investigation. They could have made so many different choices along the way….Karma! What I don’t understand is why anyone (or any business) freely chooses to be dishonest, deceitful, or exploitative, because it creates only a short-term gain — it is not sustainable over the long-term. Even though it might be “easy” to get away with deceit occasionally in a culture of complacency, it’s a game of Russian roulette. Eventually a strong emotional response to dishonesty (coupled with the energy to pursue remediation) will emerge. For me, it was initially about my loyalty to a long-term taxi service to let them know about their problem and offer them a chance to remedy my experience. Later, it was about warning others. Be honorable; do unto others, as you would have them do unto you. Skip the shortcut, especially if safety or credibility is involved. 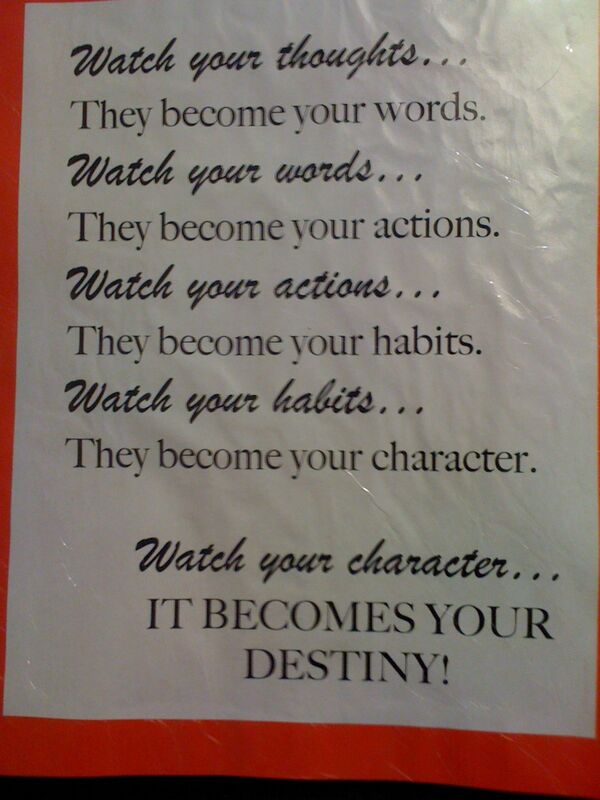 Make your choices as if they will be your destiny, they will. Eschew complacency and participate in feedback, create opportunity to correct honest mistakes, amplify generosity when deserved, and warn others if necessary. I have been a long believer that everyone makes his or her own karma. If you live honestly, with integrity, and are generous, you will be reap value and amplify positivity over the long view. Conversely, if you live dishonestly, deceitfully, are exploitative, it will catch up with you. What kind of karma are you creating and amplifying? P.S. The destiny poster (at right) is courtesy of my son’s middle school, it hangs on the wall. P.P.S. I received my $22 check today.